Time of Origin: Earth; encountered The Doctor in 1941 and 1959, and apparently managed to travel up to 1962 on one occasion. Appearances: "Illegal Alien" and "Loving the Alien". History: In all his travels, The Doctor has never encountered any human being as unbelievably evil as George Limb, and, out of all her confrontations with evil in all her travels in the TARDIS, his companion Ace regards Limb as the enemy she has hated most (Although this is mainly because she actually liked him at first). The only thing that can be said to Limb's credit is that he is not actually evil, per se, but rather, like The Doctor's fellow Time Lord The Rani, has a mind that regards the world as his own personal chemistry set, regardless of the consequences for the universe around him as a result of his experiments. Obsessed with knowledge, information and communication, Limb’s greatest fear was that he would die without knowing what the future held, driving him to commit atrocious actions in the name of his continued existence to see the future. 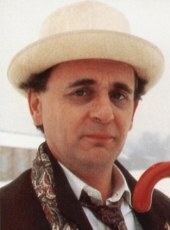 The Doctor and Limb eventually met when the Seventh Doctor, accompanied by Ace, local private eye Cody McBride, and police inspector Mullen, was investigating a serial killer who was literally crushing his victims to death in 1940. Joining McBride to investigate the deaths, The Doctor and Ace were introduced to George Limb, a former politician whose career allegedly ended when he took the blame for leaking a government document to the press to spare Winston Churchill dealing with the fallout (It is unknown if this is true or simply another lie). Discovering evidence of alien involvement when given a contact card containing a sophisticated tracking device, followed by an attack by a Cybermat, The Doctor deduced that the serial killer was a flawed Cybermen seeking human blood to repair the bond between its organic and cybernetic components. Despite being hampered by another policeman’s belief that the Cybermen were merely Nazis in body armour, The Doctor discovered that the Cyber-Leader had been sent back in time to prepare an army of sleepers to mount an invasion. Taking advantage of a German bombing raid, The Doctor, McBride and Mullen turned on all the lights in the Cyber-conversion factory and escaped before the Germans destroyed it, leaving The Doctor to confront Limb, who had discovered the Cybermen and secretly sold their secrets to both sides in the conflict in order to provoke an arms race which will increase the rate of human technological progress. Deducing The Doctor’s nature as a time traveller, Limb attempted to blackmail The Doctor to take him to the future by threatening Ace, but the situation degenerated when The Doctor was forced to activate the dormant Cyber-army to fight off a group of Nazis. Desperate to escape, Limb attempted to use the Cyber-Leader’s time machine, but it apparently malfunctioned, scattering Limb across time and space and slowing time in the immediate vicinity long enough for The Doctor and Ace to escape back to the TARDIS before the factory exploded. As it was later revealed, however, Limb had not died, but simply been transported a decade or so into the future. Although the machine’s range was limited - the furthest into the future Limb had ever gone was 1962, and that was only once, - it was enough for Limb to travel back and forth multiple times, creating various alternate realities with each trip… including one where Britain won the Second World War in 1943 with Cyber-technology, resulting in the creation of an alternate Britain where almost the entire population had cybernetic implants (Another, smaller change featured him saving James Dean - who subsequently worked with him using the name ‘Jimmy’ - from dying in a car crash). However, unable to control his travels, he was eventually catapulted from the machine, sending him back in time while remaining in 1959… and, despite all the consequences of his actions, Limb was unable to change one fundamental detail of his future; every future he saw culminated in him being converted into a Cyberman. He tried to avert this by triggering a war with Russia by provoking an arms race by selling them the secrets of the Augmentation project (Based on the Cybermen who’d remained in the London sewers after "Illegal Alien"), but when, a few days before he reached the point where he’d left the machine, he encountered Ace once again, he lured her into a trap, killed her and planted clues on her body to lure The Doctor to the present, hoping that The Doctor could teach him how to change his future and travel safely in time. Furious, The Doctor told him that time travellers couldn’t change their own history, and that his meddling had caused the barriers between realities to break down, pushing the Time Vortex to the brink of collapse; not only had a reporter called Rita Hawks accidentally travelled to the Cyber-Britain reality, but giant ants were already swarming through London (Size was apparently not a constant across alternate dimensions). Even worse, the Cyber-Britain, having discovered the rift between their worlds, was attempting to launch an invasion of its counterpart to cope with the ever-increasing population - with nobody really dying thanks to the Cyber-technology, the world was becoming too crowded, - forcing The Doctor to release an army of augmented apes created by the Augmentation project to hold off the alternate timelines’ soldiers while he tried to find Limb. Confronting Limb and his counterpart - the Prime Minister of the other Earth, - The Doctor revealed that the other Limb was also partly cybernetic, driving Limb to kill his other self and flee to his time machine in a desperate attempt to avert his future once again. In the final confrontation, The Doctor was able to make Jimmy see Limb for what he really was, and Jimmy, enraged, drove a car into Limb’s time machine, dying in the accident and destroying the machine once and for all. Accepting that he couldn’t change his destiny, Limb, gravely injured in the explosion, shot himself in the graveyard where he’d left the machine, The Doctor staying with him to ensure that he didn’t die alone. With Limb’s death - his existence having apparently been the central crucible on which the existence of the other alternate worlds hinged, - reality sorted itself once again, although with various differences in the ‘core’ reality from the history that had been before… including the presence of an Ace from an alternate reality who’d never been shot. As they celebrated their victory in a local pub, The Doctor admitted to Limb’s niece - the only person to ever see Limb as a good person - that he regarded Limb as the strongest, bravest, most intelligent human he’d ever met, omitting his negative qualities for her sake.